Washington, D.C. based artist Jenne Glover believes that art can inspire conversations, connections, and celebrations among people. 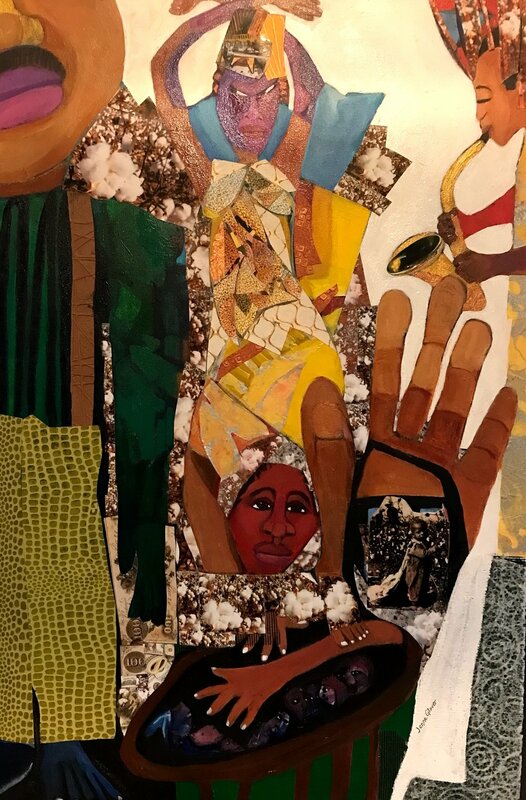 Her latest exhibition opening at Arts & Education at the Hoyt, Resilience: Surviving the Middle Passage, Seeking to Live a Privileged Life (January 8-March 28), is intended to do just that. The colorful body of mixed media collages illustrates the African experience on its way to the New World. According to the artist, each piece represents a moment of an uphill climb. Some mental, physical, emotional or spiritual pain on the journey between then and now. Yet they also reflect the inner strength and the dexterity that “comes with crazy”. Glover hopes that the exhibit will promote dialog on social reform, justice and equality. Glover evolved from a figurative painter to a mixed-media collagist over the last 30+ years. Today, mixed media collage is her primary medium. Compositions are constructed of magazine cutouts, ready-made materials, paint, oil pastels, fabric, and repurposed images from my earlier works that are altered, fragmented and reassembled on to canvas. The result is a blend of color, texture, pattern, and rhythm that are very appealing to the eye. Resilience will be on display through March 28. A Public Reception will be held on January 12, 2-4 pm. Admission to the galleries is free. While the work of Robert Noel Blair (1912-2003) may be more widely known than that of his wife, Jeanette, she has certainly found her own place in the esteem of the Western New York arts community as evidenced by the recent publication, Jeanette Blair, Selected Works: A Survey of 60 Years of Art, (2016). The expressive body of work within, illustrates a shared love of the landscape, influenced as much by each other and by the American watercolorist, Charles Burchfield. It was this book that inspired local artist and Hoyt Trustee, Wendy Warner, to propose the upcoming exhibition in the Main Galleries, The Paintings of Jeanette Blair, August 7-October 11. Having studied under Blair herself, Warner was not only well acquainted with their work but with the personalities of their prolific creators. Thus, she accompanied Hoyt Exhibition Manager, Patricia McLatchy, to curate the selection of works to be featured in the show. As a student and later teacher at the Art Institute of Buffalo in New York, Jeanette was actively engaged in artistic circles since the 1940s. She married Robert in 1943 and found in him a supportive partner for her own career. She was an active, exhibiting member in the Associated Arts Organization, Watercolor League of Western New York, Patteran Society of Buffalo, and the Buffalo Society of Artists from which she received numerous awards. She also exhibited at the Albright Knox Gallery, the Chautauqua Institute, and the Butler Institute of American Art. The birds and local scenery of Nancy Connelly’s sculpture and pastels will complement the Blair’s work in the Walkway Gallery. The birds are created from driftwood or other random pieces of nature collected during walks. “After seeing a whimsical bird in a gallery, I wanted to try my hand at it,” she said, “I had limited resources to start – just a few pieces of unburned wood from the fire.” Connelly concluded the natural shape of the material tends to dictate what it becomes.